Remember the song, "Don't Worry, Be Happy".....don't worry be happy now! This song started playing in my mind when I saw the big grin on the Poodle boy in this photo that my friend Chris L'Abbe shared with me. As we get older, cold weather can tempt us to just stay inside and hibernate as much as possible until Spring. But most Poodles don't feel this way at all. Think about how many times you have seen a Poodle with the "zoomies"--running huge laps around the yard when the weather starts to cool off. Isn't it funny too how if we have a pile of leaves that we raked, Poodles will, just like kids, make sure they head right for them while they are zooming! One thing that has always interested me is that I often see my older dogs zooming around the yard as the leaves begin to fall, even though it is inevitable that many of them are experiencing more arthritis pain due to weather changes but still, even though they may not be able to "zoom" quite as long as the younger guys, they are still going to take a lap or two. Dogs seem to have an unlimited capacity for joy--at least the average Poodle is this way. He is just looking for a reason to be happy! 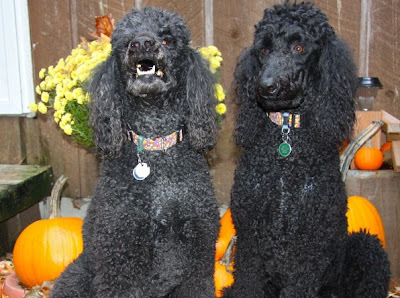 Let's take a lesson today from our Poodles---Don't Worry, Be Happy, Be Happy Now! Poodles Behaving at the Dog Park!